Are you ready to get up early in 2014? You better get to bed early. The NFL announced on Wednesday that the 2014 International series game between the Falcons and Lions on Oct. 26, 2014 will begin at 9:30 a.m. ET. In case you’re wondering, there has never been a game that has kicked off that early in NFL history. 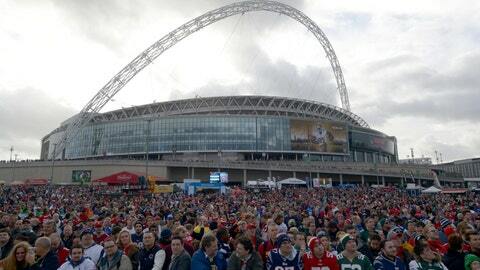 "We are excited about playing three-regular season games in the UK for the first time and debuting a new game that we expect to be a hit with fans on both sides of the Atlantic and around the world," NFL chief marketing officer Mark Waller said on Wednesday. Now, while I’m sure a 9:30 a.m. kickoff is something that would send that average resident of the eastern seaboard into a tizzy, it’s actually old hat for people living on the shores of the Pacific Ocean. We’ve been doing this for years. 1. Instead of beer, think mimosas and irish coffees. There’s no way to drink beer or hard liquor before 11 a.m. without coming off like a raging alcoholic. I’m aware that irish coffee does have booze in it, but for some reason, I don’t think that counts. Make sure to have enough bottles of champagne for your mimosas, too. You’d be surprised how fast you can go through those. 2. Instead of ribs and burgers, go with breakfast food. Don’t laugh, breakfast food is amazing. Go ahead and go big. Giant omelettes with cheese, meat and veggies; belgian waffles, the whole nine yards. 3. Pace yourself. Remember, you’re going to have to last an entire day, rather than just an afternoon and evening. Sip, don’t gulp, if you catch my drift. 4. Oh, you’ll actually have to set your alarm. Bummer, right? That means you can’t stumble home at 3 a.m. after a Saturday night on the town and expect to get up in time. You need sleep. 5. You’ll have to eat again sometime between the end of the 1 p.m. games and the late afternoon starts. Think a sandwich, maybe some snack items. Remember, you had an enormous breakfast. 6. Try and think like a Californian. Sorry, I’ve just always wanted to give East Coasters that advice. They’re just so angry all the time. It doesn’t really apply here though. Anyway, follow those simple rules and you should fine. However, this 9:30 a.m. ET start also means that west coasters will be watching this game at 6:30 a.m. People in Hawaii will be glued to their TVs at 3:30 a.m. Yikes. My suggestion is … just don’t go to bed the night before.